Great legs, super shoulder, lovely hip, beautiful head and all the movement a top rider looks for in a first class prospect. 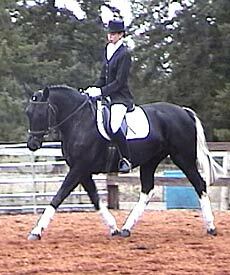 This horse is picture-book quality to look at — she's stunning. 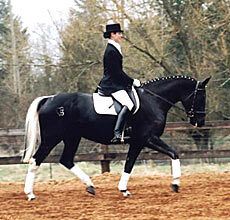 Very well started under saddle, she could go dressage or as a jumper. Very trainable mind. She's perfect in every way. Recent x-rays, clean. Flash! 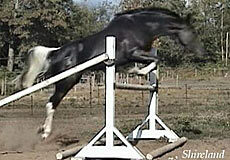 Click here to see her 2003 filly! 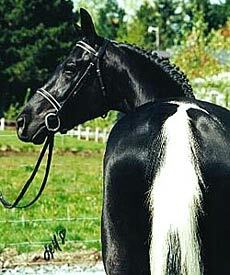 You rarely see this type of quality and true, rich black color ... and flashy white markings to boot! Sorry, no video. 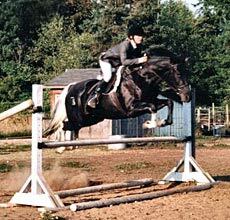 16.1hh. 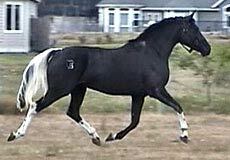 For a horse very similar to this in age, color, size, suitability, and training level in the $40,000.00 price range, please send us an email and we'll notify you as soon as one might be available! Please let us know your specific needs and we'll do our best to find a perfect match within your budget.